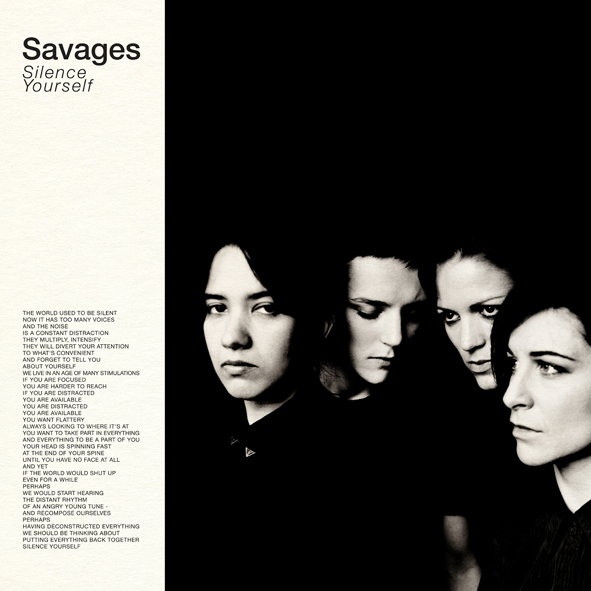 Savages will release their debut album Silence Yourself on 6th May 2013 on Matador Records / Pop Noire. Available on LP, CD and download, the album was recorded in north-west London's Fish Factory during a three week period in December 2012, and is produced by Johnny Hostile / Rodaidh McDonald. Clocking in at 38 minutes, Silence Yourself opens with an excerpt from the John Cassavetes film 'Opening Night', and features brand new recordings of 'Husbands', 'I Am Here' and 'City's Full' - first heard on debut single 'Husbands / Flying To Berlin' and the 'I Am Here' live EP - both previously released on singer Jehnny Beth's record label Pop Noire.